From its early days to the modern era, UMKC has played host to actors, musicians, athletes, authors, activists and revolutionary thinkers. Judith Martin — better known by her pen name, “Miss Manners” — came to Kansas City as keynote speaker of the Cockefair summer lecture. Her columns, managed by local syndicate Andrews McMeel, are carried by more than 200 newspapers in the U.S. and abroad. Writer Maya Angelou spent an evening at UMKC with students and visitors. Angelou gave a lecture and shared excerpts of her poetry at an event hosted by the Office of Student Life in Swinney Recreation Center. Jazz legend Ella Fitzgerald performed in Pierson Auditorium as part of UMKC’s “Count Basie Day” honoring Basie’s jazz legacy. She also accepted an honorary degree from UMKC. Singer Nina Simone and musician Herbie Mann performed for students at a concert sponsored by the University Program Council and Ford Motor Company. Concert tickets cost $1 and, as an added attraction, record albums were given as door prizes. Eleanor Roosevelt spoke to a 500-person audience at the University Playhouse. Accompanied by former President Truman and his wife, Bess, Roosevelt discussed her work at the United Nations in a meeting sponsored by the Young Adult International Relations Council and the American Association for the United Nations. Entertainer Bob Hope made an impromptu visit to UKC, along with Doris Day and alumna Ruth Warrick (Theatre ’38) to rehearse for a performance that evening at Municipal Auditorium. Word quickly spread that the trio was visiting, and the campus community packed the University Playhouse for a chance to see Hollywood up close. 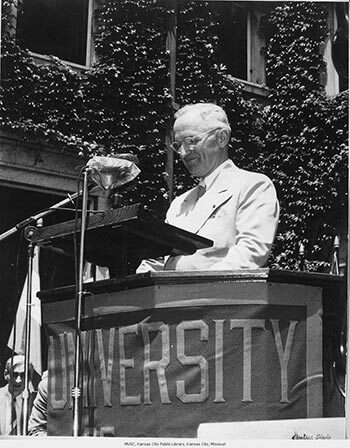 President Harry S. Truman served as guest speaker and honorary degree recipient at the School of Law’s 50th anniversary alumni reunion. In celebration of his homecoming, the president rode with fanfare down the streets of Kansas City on his way to campus. The honorary degree presentation took place later that evening in a public ceremony at Municipal Auditorium.